Trying to make meaningful comparisons between engine types can be confusing. Aside from the common usage of two (or more) units of measure for each specification, there are often multiple ratings for each engine model. In many applications, such as marine and generator sets, special ratings are offered that are intended specifically for a particular usage. These special ratings usually have limitations placed on them. The “metrification” of units of measure seems to be almost universal. Most specification sheets show both S.I. and older SAE measures. 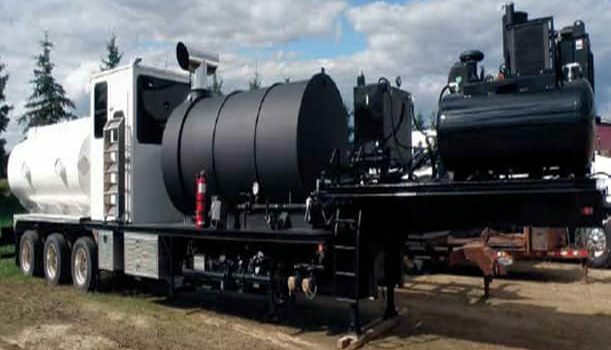 There are many readily available conversion tables that provide easy translation of the common units used to describe diesel engine specifications. While it is not the intention of this writing to serve as a conversion chart, a few common units of engine measure are converted below. Note: It is important to use the same basic criteria when making any comparison. For example, as long as each engine’s fuel consumption uses the same weight per unit of fuel the comparative performances will be meaningful. In spite of “metrification”, diesel engines are often referred to by their horsepower outputs. The metric comparison is kilowatts (kW). Until recently, in North America, engine output was measured in horsepower and electrical output in kilowatts. 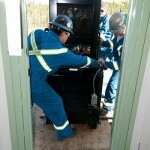 This can lead to some confusion when the engine is required to drive a generator set. The mechanical kilowatt output of the engine (kWm) does not allow for efficiency losses in the generator, or perhaps other parasitic losses such as a cooling fan, before the generator’s electrical output, measured in electrical kilowatts (kWe). Kilowatts (electric) is the power available at the generator terminals. As with engine power ratings, there may be three or more generator ratings (continuous, prime, and standby) dependant upon the intended usage of the machine. There are several common methods of rating industrial and marine diesel engines. 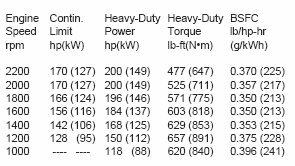 It is not unusual to see five differing power output ratings for the same engine model. Ratings may be performed to “DIN”, “SAE” or JIS (three governing bodies) standards. Basically, the most important factor is the intended usage of the engine. Determine which rating you need to use for the intended service of the engine and ask for the HP or kWm rating of the engine to be expressed in the most suitable terms. All manufacturers who offer multiple power ratings also offer guidelines for the usage of the engine at the various power ratings. An example of this would be illustrated by the following sample curves. The horizontal axis shows engine speed in revolutions per minute (RPM) and the vertical axis indicates power in both kWm and in HP. There are two curves shown and the testing standards are indicated (ISO 3046). Typically these curves are referred to as “continuous” (the lowest output), and “intermittent” (the upper curve). Given equal or better conditions than the test conditions for fuel, ambient temperature and altitude, this engine would provide the user with any of the power outputs shown at any of the speeds shown. Probably nowhere can more “elastic” ratings be found than for high-speed marine engines. One reason for this is that the usage of marine diesels can vary from full power, “24/7” to very intermittent service, high speed vessels. As well, with marine engines it is possible to use the seawater for after-cooling the turbocharged intake air, allowing more fuel to be efficiently burned. 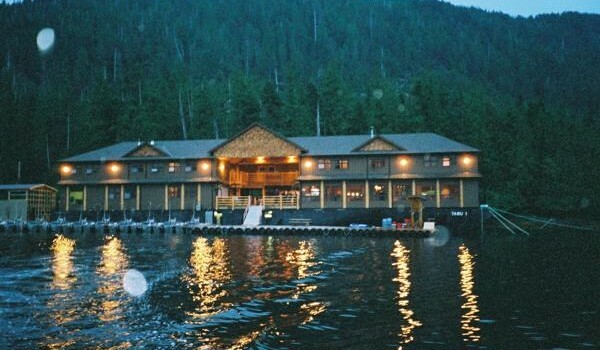 Marine, like any other usage, requires the buyer to clearly specify the nature of the vessel’s usage. So why not buy the greatest available horsepower from a given engine? The answer is engine life (for more information on engine life, see How Long Will a (Marine) Diesel Engine Last?). Engines have a design life at a given power output. The service factor of the application must be accounted for when selecting the engine. 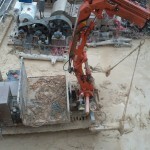 For example, water pumps may be required to operate at a given power output for long periods of time. This is a “continuous” application. A brush chipper, normally, only works hard for brief periods while material is fed through the blades. This is an intermittent duty. There are special applications as well. 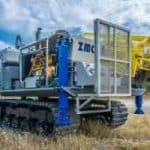 Fire pumps, high-speed emergency vessels and the like may have curves that are for use in their particular application only. Engines are initially designed to perform a service or some range of services. For example, “automotive” engines are typically compact, lighter weight engines designed for use in vehicles. 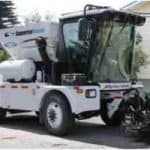 The engine may use lighter, less robust components than an engine designed for use in heavy equipment or commercial marine applications. Automotive derivative engines may still offer a “continuous” horsepower rating but the design life of the engine may be significantly less than for a heavier industrial style engine. The most common “clues” for durability are the cubic displacement of the engine and the RPM at which it develops its horsepower. There is no right or wrong in this. If the application is vehicular an automotive style engine is built for the purpose and should provide adequate life. If the application were heavy industrial an automotive style engine would be misapplied and would not provide a reasonable service life. There are tables that provide guidelines for engines used in various services. Engine manufacturers publish application information and many equipment manufacturers also provide information on input power requirements. This information and an idea of the number of hours of service required helps to define what engine is “right” for the job. It is a trade-off between power output and the service life of the engine. The key to a satisfactory experience with an engine is to define the intended usage and select an engine and a power rating that should provide the hours of service required. Horsepower is a rate of doing work. Torque is “the rotary force in a mechanism” according to a dictionary definition. The two are related (Torque lb-ft = H.P. X 5252 / RPM) but torque is often misunderstood. Since there is a fixed relationship between HP (or kWm) and torque, two engines having the same horsepower at the same RPM will have the same torque. However, at work, the two engines may perform very differently. The reason for this is they may have very different torque rises. Therefore they respond differently to the demands of the load. The length of piston stroke, number of cylinders, rotating mass and other factors, affects torque rise. Newer electronically controlled engines are able to produce torque characteristics that could not be achieved with mechanical fuel controls. In this case the rated torque is 477 lb.-ft. and the peak torque is 657 lb.-ft. @ 1200 RPM. The torque rise is: 657 – 477 divided by 477 = 38%. Note that although there are two horsepower curves, continuous and intermittent, only the intermittent torque curve is shown. 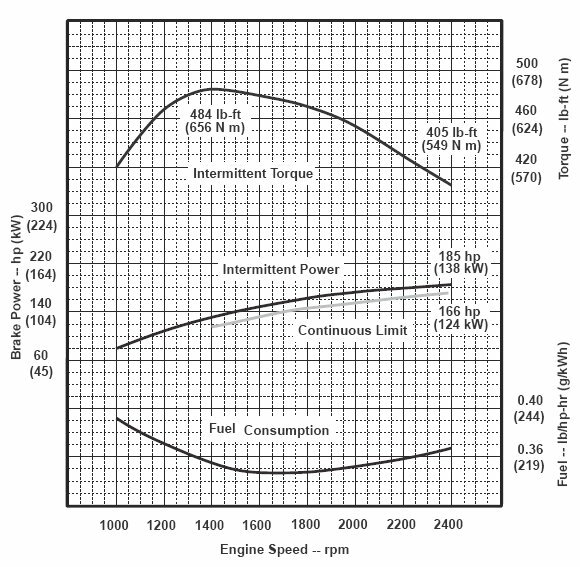 The assumption is that if the engine is “pulled down” (reduced in RPM by the load), then the engine will be performing on its intermittent rating curve. Torque curves are usually available for any published horsepower rating. Torque and torque rise are very important considerations in many applications particularly those where the engine is routinely pulled down from its rated speed owing to the effects of the load. Greater torque rise allows the engine to run at a higher r.p.m. 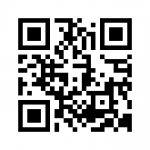 under load and thereby accomplish its work more quickly. In extreme conditions, inadequate torque rise will prevent the engine from accepting the load and it will stall. There is a lot to add on the importance of torque. “Droop” and “isochronous” governing, electronic or mechanical controls and other factors enter into the aspects to consider. Again, if the intended usage is clear, the best option will usually be apparent. For good reason, people often want to know how much fuel their engine will consume, Fuel is by far the greatest cost over the life of most engines. A seemingly small difference in fuel consumption can provide a large saving of the course of an engine’s lifetime. 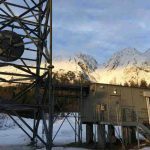 There are applications where the costs of an engine or a generator set can be returned over a relatively short period of time simply by sizing the unit correctly for the load. 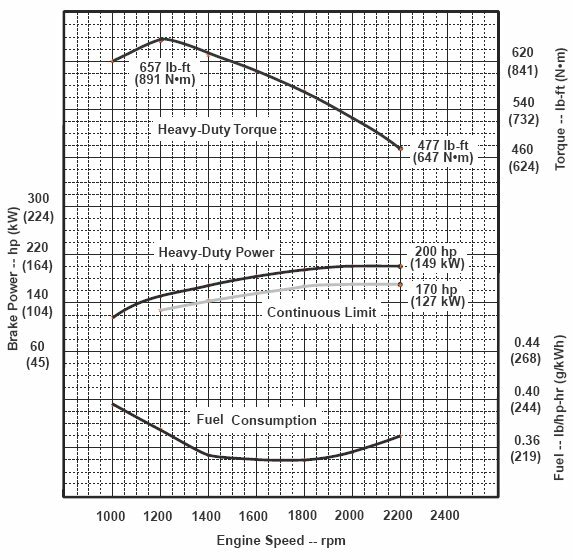 Engine manufacturers publish fuel curves. These curves are usually certified to be correct, within narrow limits, given certain factors such as minimum cetane rating and acceptable ambient conditions. Fuel consumption testing is usually done by weight of fuel consumed, over a known period of time at a known power output. The test results may be published by weight or they may be converted into volume. Many manufacturers also publish partial load fuel consumption data. This can be very important information, as most engines do not run at their full power rating all the time. Owing to efficiency losses during combustion, partial load fuel consumption is not “linear”. That is, a 50% load will not consume 50% of the full load fuel consumption. In some cases the differences in partial load fuel consumption figures can be quite dramatic when compared from engine model to model. Modern diesel engines, especially electronically controlled engines, are very efficient in terms of usable energy produced for the fuel expended. However, any engine has to be correctly applied in order to provide economical and reliable service. The only way to accurately predict fuel consumption is to know what the load on the engine will be. Sizing the engine correctly is critical. Too much power for the load will result in poor fuel economy (and other problems). Too little power will result in a shortened engine life. In many applications a fuel consumption curve can be used to help find the most economical source of power. Here is an example of what one might find when looking at fuel consumption curves. 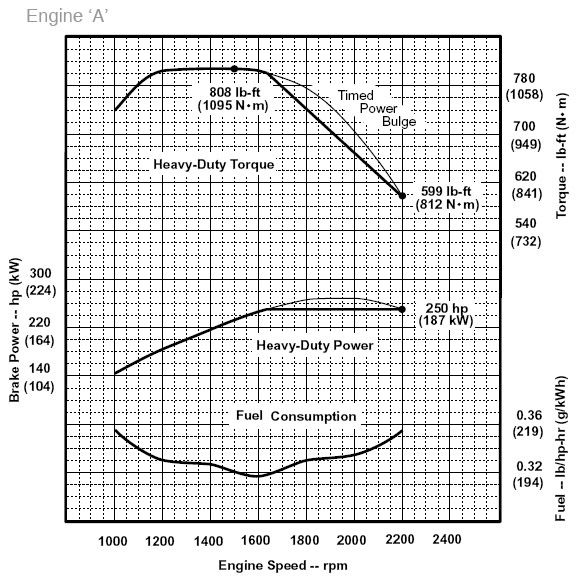 Chart ‘A’ shows a “Heavy-Duty” horsepower curve for an engine rated 250 h.p. @ 2200 RPM. 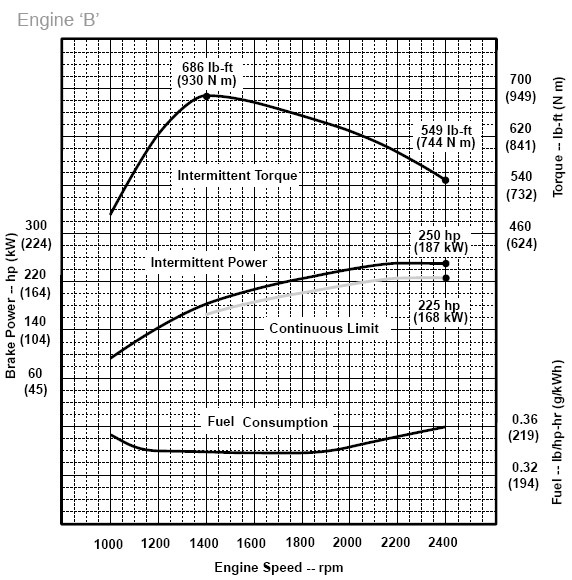 Chart ‘B’ illustrates a horsepower curve for an engine with a rating of 225 h.p. (continuous) at 2400 RPM. The difference in fuel consumption is only 0.03 lbs per horsepower per hour. However if the pump operated for 2500 hours in a year (48 hours per week) the fuel savings would be 2,475 US gallons (9,405 litres). Over the expected life of the engine, this represents a huge saving in operating cost. Staying with our example of ‘A’ and ‘B’, one would expect that to produce same continuous horsepower at a lower engine speed would require a larger displacement engine. So the initial purchase price of the engine and its accessories (radiator or other heat exchanger, air cleaner, muffler, etc.) would be higher. However when selecting an engine, fuel consumption costs should be considered. This is especially true in applications required to run long hours in areas where the cost of fuel is particularly high. Many applications allow the engine to be operated, under normal circumstances, at a pre-selected engine RPM. It can pay big dividends to select an operating speed where the engine delivers its best fuel economy.